Grantham is, apparently, a market town with a good reputation when it comes to conference and hospitality. As everyone knows these days, conference and hospitality is a big deal when it comes to the business world. The need to impress clients, colleagues and business associates is incredibly important, so ensuring that you make a great impression at events such as these is essential. But what you may surprise you is that there’s a new player in the catering world when it comes to impressing clients. Welcome to hog roast Grantham! Yes, hog roast really is making a name for itself as a fantastic corporate catering option and hog roast Grantham functions are set to become far more frequent occurrence in this part of Lincolnshire. Hog roast at your corporate event is a winner for everyone concerned. Hog roast shows that you like to do things a little differently and that you are not afraid to take a risk with something new (not that hog roast is new, of course. It’s been around since medieval times). Hog roast is a break from the safe old catering options that have plagued corporate functions for years. Your hog roast Grantham function can be one that helps break the mould. Hog roast is a pretty spectacular event in itself with the hog roast chef being the conductor to the orchestra that is the actual roasting pig. 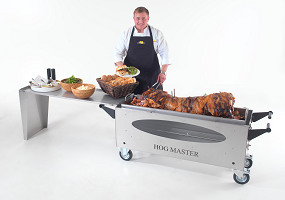 If you have ever been to a hog roast function then you’ll know just how amazing a hog roast looks whilst it’s cooking away on the impressive looking piece of gear that is the hog roast machine. The Taste the Cracklin chef taking care of your event will be making sure the hog is roasted and cooked to absolute perfection, indeed they will probably have been cooking the hog roast for some hours beforehand as the whole process takes around six hours. It is of course worth it, with some remarkable tasting meat and superb crackling the result. Then there’s a great choice of menus to choose from. The gourmet menus really do show off hog roast at its very best at a Grantham event with apple sauce, stuffing and crispy crackling helping the meat slip down perfectly. This is food that will not only taste fantastic but look fantastic, too. Gone are the days when hog roast was just a meat in a roll option at events. Great though that is (and of course, it’s an option you can choose) there really is no better meal for an important business event than hog roast served up professionally. Your guests will be delighted at this great catering solution and, hopefully, it may just get discussions about a few deals going a bit more swiftly. So what’s it be next time you plan an important Grantham function? Are you going to play it safe and just serve up the same old food or are you going to make a bold statement and choose hog roast as an exciting alternative? I think I know what your guests would prefer.